Barry Allen has trust issues, and all of them are well earned. As a child his mother was murdered and his father went to jail for it. As an adult he lives a double life, fighting crime and spending most of his time hiding who he really is. His mentor killed his mother and was directly responsible for the death of his friend. Good looks and speed might come easily to Barry, but closeness does not. After taking six weeks off for winter break, The Flash returned firing on all cylinders, progressing numerous storylines while highlighting Barry's many intimacy issues. In 'Potential Energy', directed by Rob Hardy and written by Bryan Q. Miller, Barry (Grant Gustin) and the Star Labs Team go up against Cisco's (Carlos Valdes) great white whale: a metahuman called Turtle, with the power to slow down time. 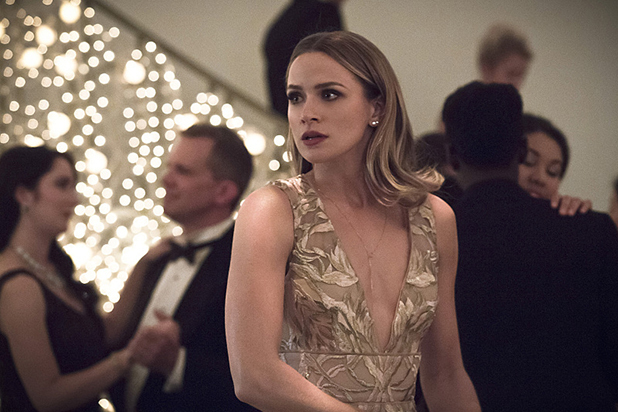 They work together to stop the meta thief while Barry struggles with hiding his life as The Flash from his now-serious girlfriend Patty (Shantel VanSanten). 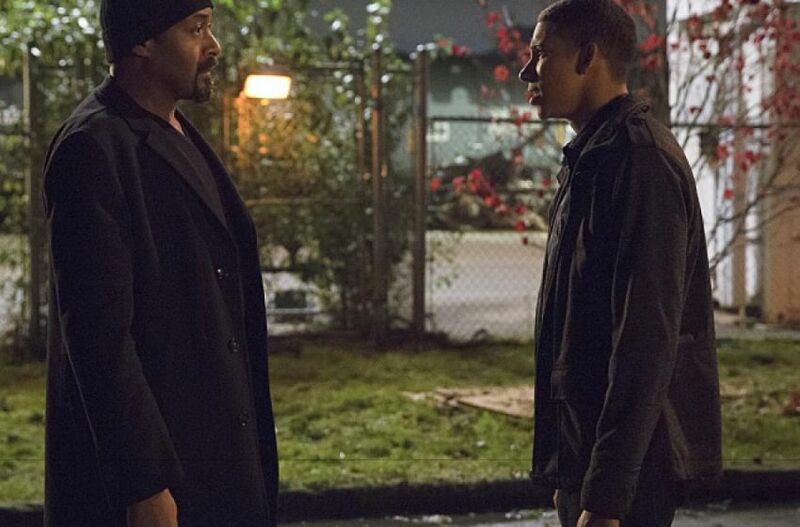 Meanwhile, Joe (Jesse L. Martin) and Wally (Keiynan Lonsdale) West struggle with what it means to suddenly become family. This episode marks Battlestar Galatica's Aaron Douglas' turn as The Turtle, a thief who has the ability to slow time. He uses his powers to steal only what matters most to people - and that often includes expensive artwork and priceless jewelry. Much to Barry's surprise this particular meta is one that Cisco has spent a long time searching for, and the team quickly hatches a black-tie set up to take him down. While this particular bad guy doesn't pack the strength of the Atom Smasher or the malice of the Weather Wizard, he does dovetail nicely with the episodes over arching themes of Barry's speed, in life and his relationship with Patty, conflicting with the dangers of extreme slowness in his reluctance to let Patty in on who he really is. The Turtle searches for precious things the same way that Zoom does, highlighting everything Barry stands to lose. Barry and Patty pick up where we left them at Christmas, endlessly compatible but stuck in second gear as Barry keeps all of his meta-cards close to the chest. Though hiding behind the anniversary of his mother's murder seems a bit callous for our normally sweet hero, he cannot exactly share that he's been having recurring nightmares about Zoom killing her. After a pep talk from Iris, Barry vows to tell Patty the truth. In a moment of logic so flawed you just have to move right through it, he decides the best way to bring her into his world is to tell her his secret while on a mission to take down The Turtle. Spoiler alert: it does not go well. The only disconnected subplot from the rest of the episode is the continued introduction to Wally West, which stays far away from the action at Star Labs. Wally might have shown up in Central City looking for Joe, but that doesn't mean he is ready to play a game of father-son catch. Between passive aggressive - but not unearned - remarks about Joe's detective skills and ditching family dinner, Wally clearly has some resentment and bitterness at his new family, Barry included. After being caught drag racing, Wally lashes out at Joe but returns later to bond over Chinese food. The emotional upheaval feels appropriate and succeeds where The Flash sometimes falters, dealing with the fallout and real world implications of the characters actions. We know that Wally might have a future as Barry's sidekick, but we need to see him grow into that person. Building a relationship with Joe and working to be part of the West family continues to build upon the small family drama they have set up, and a quick resolution would not have been a satisfying one. Martin is already an emotional bedrock of the show, and Lonsdale went toe to toe with him, transforming a role into something so much more than just the moody, angry, teenager he could have been perceived as. Their easy chemistry bodes well for the future. When The Flash saves Patty at the art showing, Turtle kidnaps her - determining that she is what he cares for most. Barry is able to save her and keep his identity a secret, even as the smart detective not recognizing her boyfriend begins to stain credulity. Barry started and stopped himself from telling Patty the truth numerous times in this episode, scared to let her in, afraid of her getting hurt, and ultimately failing to overcome his trust issues. Tired of Barry's mercurial moods and ready to chase her own passions, Patty decides to leave Central City to go to school for CSI - a dream she had deferred to catch her father's killer. 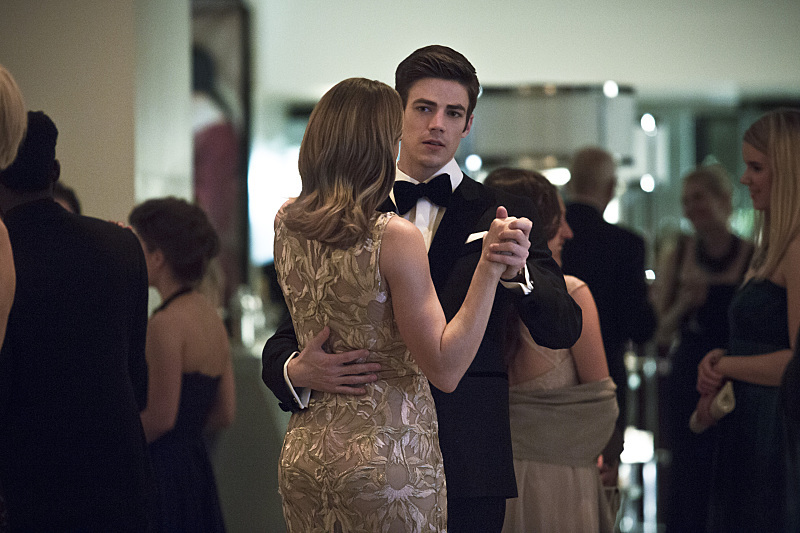 Their breakup highlighted the tenderness of the characters, Barry's vulnerabilities and Patty's kindness. Hopefully this is not the last we have seen of VanSanten; she has been an excellent cast addition and a fun love interest for Barry. Meanwhile, Harrison Wells is searching for answers. The Flash has aired a number of episodes since they revealed that Zoom had Jessie Quick, but this episode highlighted that loss. His consternation was evident as he warned Barry about the dangers of bringing someone he cared about into Zoom's orbit, and his story about how Zoom got his moniker was chilling. It's a testament to the strength of Tom Cavanagh's acting that Wells 2.0 feels so distinct from his predecessor, and his emotional beats feel well earned. The episode provided a few nice cliffhangers amid the action and the angst. Caitlin Snow, who has had little to do lately besides shake her head at Barry and solve the occasional math equation, made a tragic discovery: her new boyfriend Jay Garrett is dying. The only solution is getting his speed back, driving the stakes that much higher in the fight to kill Zoom. Wells extracted something from the jailed Turtle, presumably the key to slowing things down - but is it Zoom or Barry he seeks to hold back? Finally, in a classic end twist we're taken to a quiet street that's suddenly filled with a yellow streak that can only mean one thing. The Reverse Flash has returned, and Eobard Thawne is lost in suburbia. All in all, 'Potential Energy' feels like a true return to form for the show now that the crossover integration and mid-season finales are over. 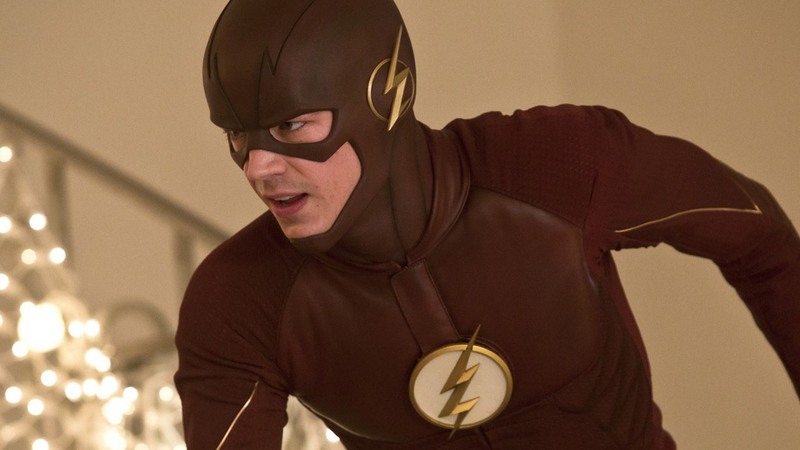 The Flash has picked back up with a light easy energy amid the action and bearing all of the hallmarks of what makes it so successful and enjoyable: fun, humor, and comic book lore mixed with a whole lot of heart.